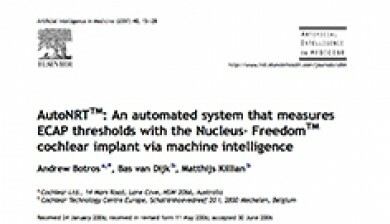 AutoNRT™: An automated system that measures ECAP thresholds with the Nucleus® Freedom™ cochlear implant via machine intelligence, Artificial Intelligence in Medicine (2007). This article describes AutoNRT, the first commercial application of machine learning in the cochlear implant industry. Andrew created and co-led the project from 2003 until its launch in 2005. AutoNRT remains in routine use in operating theatres and clinics worldwide. 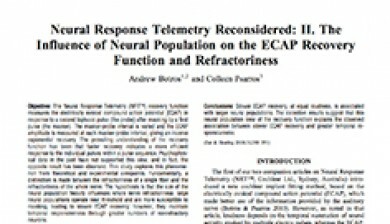 Neural Response Telemetry reconsidered: I. 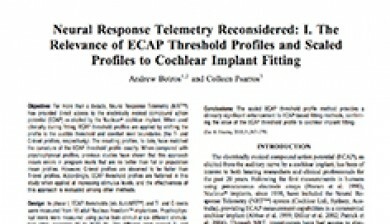 The relevance of ECAP threshold profiles and scaled profiles to cochlear implant fitting, Ear and Hearing (2010). This article describes a new method to apply auditory nerve responses in the fitting of cochlear implants. The statistical analyses of entire clinical databases led to the discovery that equal loudness contours become flatter at higher stimulus levels in electric hearing, just as they do in acoustic hearing. Neural Response Telemetry reconsidered: II. The influence of neural population on the ECAP recovery function and refractoriness, Ear and Hearing (2010). This article describes fundamental research in the neurophysiology of electric hearing. The statistical and computational analyses led to the unexpected discovery that whole nerve refractory properties are quite different to single nerve fibre refractory properties. 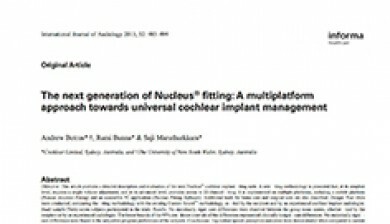 The next generation of Nucleus® fitting: A multiplatform approach towards universal cochlear implant management, International Journal of Audiology (2013). Expressive Engineering wrote this article on behalf of Cochlear, and furthermore performed the statistical analyses within. The article describes the next generation of Cochlear's software. Andrew was its chief creator from 2007-2010, building on the AutoNRT technology.